As well as optimizing imported pictures, WebSite X5 also provides a versatile built-in graphic editor for adding professional finishing touches to the pictures. The Image Editor can be opened by pressing the Edit... button, which is usually found in the windows where graphic files can be imported, such as Image Object, Gallery Object and Shopping Cart. 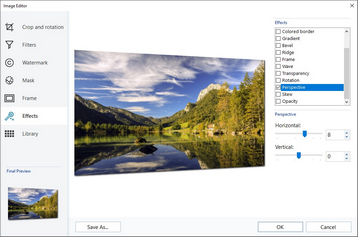 ▪ OK: this button closes the Image Editor and takes you back to the main window, saving any changes you may have made. ▪ Cancel: this button closes the Image Editor and takes you back to the main window, without saving changes. ▪ Save As...: this button saves a copy of the original picture in .PNG format.